Funny since it happened to Arkansas and not UK. But it really violates the spirit of the fair catch rule. The rules are getting more and more protective against injury all the time to the point defensive and special teams players have to err on the side of safety or risk 15 yds and ejection. I therefore think tricking them into pulling up and then you take off running is pretty dirty. Almost seems like it should be a penalty on the return team. But for now...Ha ha ha...gotcha! 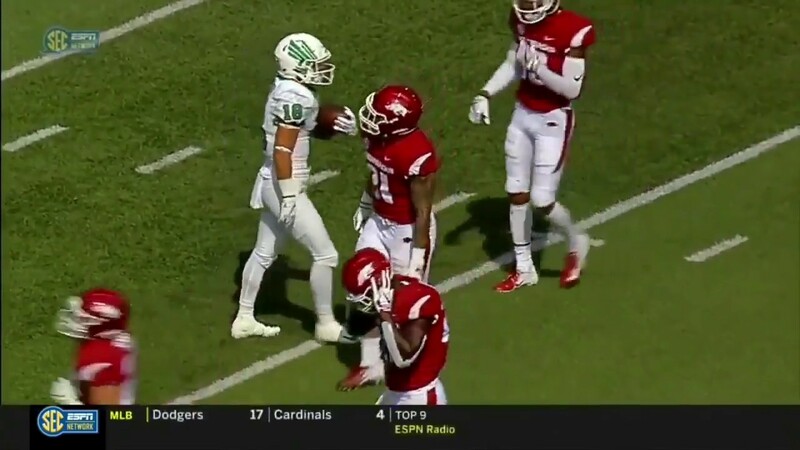 That was an incredible beat down the "Mean Green" put on the Hawgs yesterday. It's almost like they have already quit on their new coach. i imagine the fan base mid 40 years old and older are in a boil. I would not be surprised to see a change that results in unsportsmanlike conduct or some other penalty when teams use trick plays like that, the Kansas guy in the blue uniform lying in the blue end zone on a kickoff, or some of the trick plays Indiana ran a few years ago where they’d act as if a time out had been called or the QB was tying his shoe or something. Though within the letter of the rules, that stuff isn’t in the spirit of the rules any more than the A-11 offense was, and they flag that now even though it, too, complied with the rule book as written. And, yes, Arkansas fans must be livid over how things are going lately. They have the inside track to take Tennessee out of discussions of who is the worst team in the SEC. Last edited by Old School; 09-16-2018, 10:40 PM. I don't see anything wrong with the play. That's totally on Arkansas. You play until you hear a whistle. North Texas has a good QB and won't lose many games this year. They will be one of those lower FBS teams that will surprise. Arkansas screwed up for sure Kevin. But tacklers are in limbo these days and I feel their plight. They're taught to fly around the field with reckless abandon but then they're supposed to be able to pull up in an instant. The same day as this play a UL player was flagged for hitting a kick receiver too soon after he caught the kick. Ref called it "interfering with the receiver catching the kick." BUT the guy caught the ball--he wasn't prevented from catching it if he caught it! Therefore the ref in essence called the halo rule--which hasn't existed for about 5 yrs. Last edited by Catsrock; 09-17-2018, 03:25 PM. I agree Old School. The rule is there to protect punt returners. I am probably a little old school myself when it comes to sportsmanship, I'm not sure I would want to be an official with some of the new rules that have to be applied/called in real time. Sportsmanship and the spirit of the game mean something to me. Winning is important, but being good enough to win with class defines the exceptional teams. So I probably hark back to the dark ages on this one.